The gymnastics business is a place where youngsters can build the confidence and positive relationships they may not find in school. FARMINGTON — Rachel Hanson, a small 10-year-old girl from Jay with an off-center pink ponytail tie holding her blond hair in place, said she’s had problems with bullies. Sometimes, she said, her classmates are so unkind she comes home from school angry and frustrated. 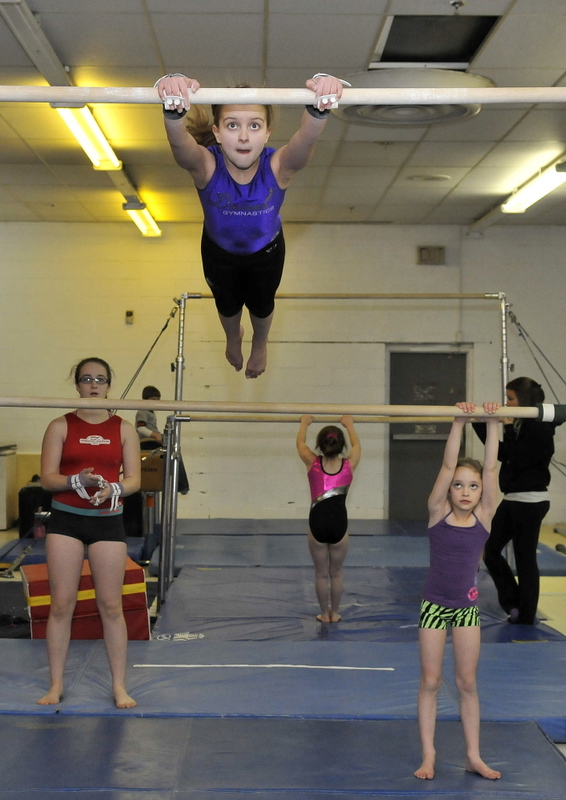 For her, throwing her slight frame into the physical challenges of gymnastics, which she learns in classes at Decal Gymnastics in Farmington, is a kind of salvation. “It’s where I get my madness out,” she said solemnly. Hanson and Parker, who said she’s had her own bouts with bullies, are two of the 150 gymnastics students who were devastated to learn that Decal was being closed for repairs a month ago, when a thaw followed by subzero temperatures caused the roof to leak and flooded the gymnasium with more than an inch of water. The loss temporarily broke up a community of young people who look to each other for the friendship and camaraderie they can’t always find elsewhere. On Saturday, Decal’s co-owners, 28-year-old Delani Evans and her mother, Carol Hamilton, held an open house to celebrate the grand reopening. Hamilton estimates that the ordeal cost the business about $7,000, partly in lost revenue and partly in ruined equipment, with some of the sodden mats having to be replaced at a cost of as much as $1,000 apiece. And for the girls and boys who look forward to going to gymnastics classes together, the cost was emotional. Her father, Dennis Hanson, who watched without a hint of apprehension as his daughter hurled herself into the air from a crossbar, said gymnastics has provided her with an opportunity to grow strong. 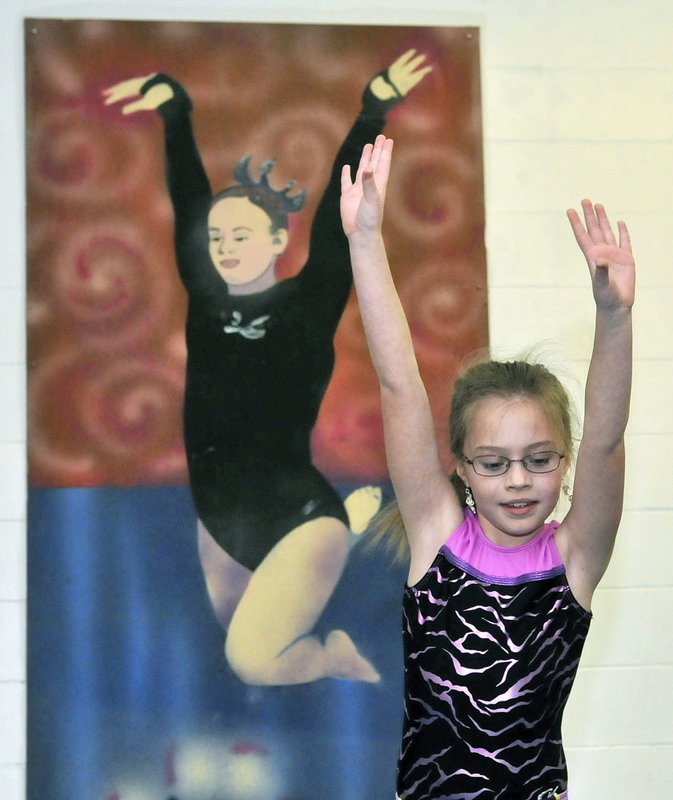 Parker, who holds her blue-framed glasses on with a strap during gymnastics, said her skills have given her a reason to be confident even when others try to tear her down. She’s learning how to do a sequence involving a roundoff, a backhand spring and a backtuck. Evans said many of the students are like Hanson and Parker. 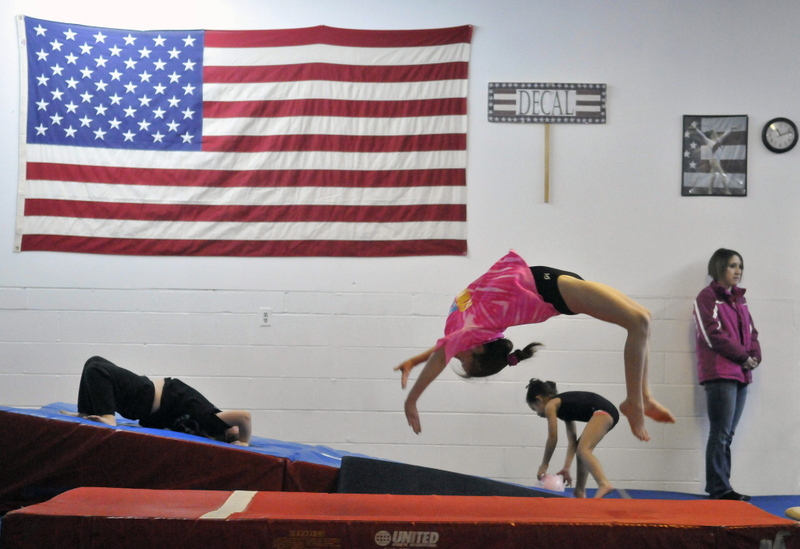 Aside from the physical benefits — gymnastics teaches kids power, core strength, coordination and balance — the very nature of the sport teaches children something even more important, Evans said. Hamilton said the unexpected closure might also have long-term costs for the business. She said it remains to be seen whether all of the students who were attending classes in December will return after the monthlong hiatus. After weeks of worry and hard work to restore the gymnasium, Hamilton said Saturday’s open house, which drew about 50 students in the first two hours, was a good sign that the small business would be able, like a gymnast performing a difficult maneuver, to land on its feet. That level of resolve to bounce back after a setback is a lesson she hopes the students will pick up.